Armour piecing rounds were developed in the 1860s to defeat armoured plate and were originally used by the Navy. 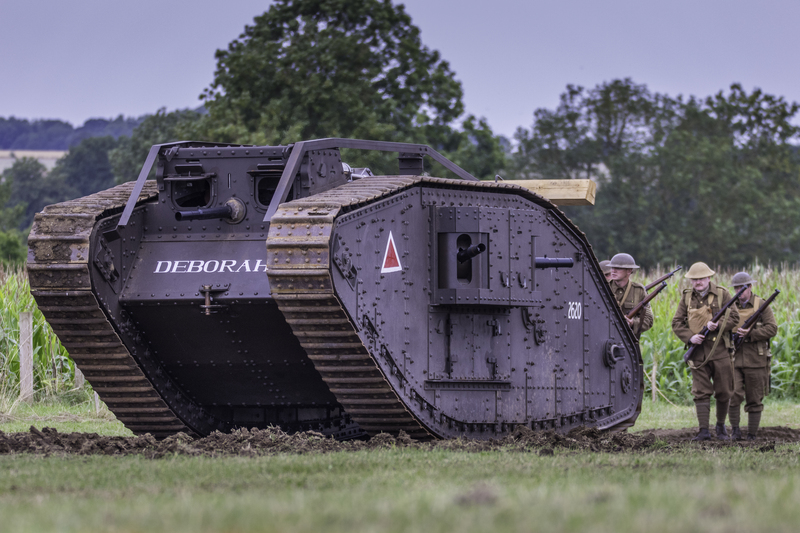 At the end of the First World War the army started using armour piecing rounds for Anti-tank operations. The Armour piecing round must be able to withstand the shock wave of punching through armoured plate without disintegrating, to enable the shell to archive this, a greatly strengthened case with a specially hardened and shaped nose had to be developed. Generally the round is made from special, high chromium steel which is forged into shape, rather than cast, and then annealed; this imparts extremely high tensile strength into the round. They are generally used against tank armour, concrete or other defences, depending on the calibre of the round being used. Armour piecing rounds contain no explosive; instead they rely solely on the massive amount of kinetic energy delivered by the explosive propellant and gun barrel design, to penetrate the armour. High explosive rounds (HE) as distinct from High Explosive Armour Piercing rounds rely more on blast and are usually detonated on impact or with a timed or chemical fuse. Their armour piercing capabilities are somewhat limited and they are used mainly against soft targets, lightly armoured vehicles and buildings. HESH rounds are a high explosive round encased in a thin outer shell with a soft plastic tip and a delayed- action fuse in the base. On impact with armour the plastic tip squashes onto to the armour forming a disc and preventing the warhead from skidding off and, owing to its relatively large and direct contact area with the armour, when detonation occurs, milliseconds later, a shock wave travels through the armour causing fragments to break off with high energy on the inside with a devastating effect. This effect is called spalling and the resultant shrapnel moves through the vehicle at high speed killing or injuring the crew and destroying equipment. HESH rounds stand a greater chance of destroying conventional armour at longer distances than AP and other rounds that rely on kinetic energy to punch their way through, they are, however ineffective against tanks fitted with spaced armour. The British army were the first to use APDS rounds introducing them in 1944 for use in the quick firing 6 pound and later 17 pound anti-tank gun. Armour-piercing discarding sabot (APDS) is a type of kinetic energy projectile fired from a gun to attack armoured targets. The need to be able to penetrate the thicker armour that was continually being developed was needed, and one way to achieve this was to increase the impact velocity of the warhead. With the development of materials science and the resulting discovery of much stronger and denser materials (up to twice the density of currently available steels), achieved with the introduction of Tungsten, greater hardness and shock resistance were created and when these properties were combined with the higher muzzle velocities provided by the new propellant explosives that were being developed, a significant improvement in penetration properties was achieved. 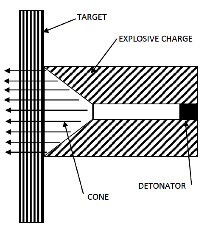 A full bore sized round was found to be too heavy to accelerate to sufficient velocity so to get around this problem a smaller projectile was encased in a lightweight full diameter, discardable carrier shell called a Sabot, the projectile was about half the weight and diameter and the Sabot made up the difference needed to fit the bore exactly. Due to the large surface area for the gases to impinge upon the lighter projectile a far higher average acceleration within the gun barrel was achieved, in turn imparting a higher muzzle velocity. Once the projectile leaves the barrel, the outer sheath (Sabot) is discarded leaving the smaller projectile with less drag to travel to its target. In all higher muzzle velocity imparted more kinetic energy and therefore greater penetration, enabling the destruction of thicker armoured vehicles at greater distances. Armoured piecing discarding sabot fin stabilized round is the next generation of tank on tank rounds, with the discovery of APDS rounds, at the end of the Second World war the quest to increase the kinetic energy and thus the greater penetration was always the goal, making the projectile thinner gave less resistance in flight but in turn made it unstable and the round tended to tumble, in order to overcome this fins were added to give stability. Some countries use depleted Uranium in dart manufacture it being even denser and therefore carrying more kinetic energy than tungsten. Canister rounds were developed for use against infantry being a steel canister filled with ball bearings and fired from the main gun, detonated by a timed fuse in flight. The shaped charge, by comparison, is light, cheap, easily portable and requires little sophisticated apparatus to deliver it to its target. It is a self-contained bomb which is detonated on impact and delivers its payload in a concentrated, narrow beam of kinetic energy which can penetrate armour steel to a depth of 7 times the diameter of the charge. The shaped charge relies on the “Munroe” effect which is the focusing of blast energy by a conical void at the front of the blasting charge. Charles E. Munroe discovered this effect in 1888 and an experiment he carried out was to tie sticks of Dynamite 91/2 lbs (4.3 kg) in weight around an empty tin can and place the assembly, open end down, onto a 41/2” (114.3 mm) thick steel plate. The detonation punched a hole 3” (75mm) in diameter.